Hindustan Aeronautics Limited, Is Looking For Eligible & Energetic People To The Various Finance/Medical/Technical Discipline, As Mangers & Officers Posts. So Interested People Can Apply For This Job Through Offline Mode, Within The Given Time Period. 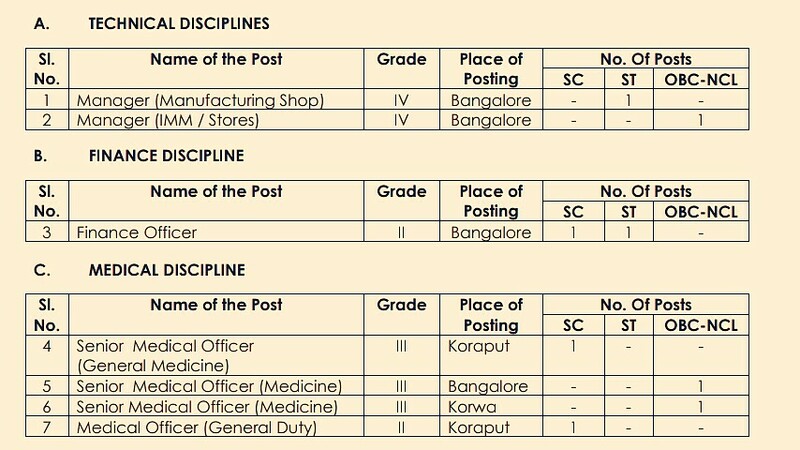 Total Number Of Vacancies →08 Vacancies, Kindly Go Through The Image's Below For Name Of The Posts, Grade, Place Of Postings & Vacancies Distribution. B. Eligible Criteria For Various Posts Job Vacancy In HAL Recruitment Notification 2019. Age Limit →Check Out The Second Image Above. Educational Qualifications →Degree In Concerned Discipline. Offline Application/Examination Fee →Rs. 500/- (Rupees Five Hundred only) towards Application Fee and Rs. 50/- as Bank charges (total of Rs. 550/-), which is non-refundable is to be paid by candidates belonging to OBC-NCL Category. The same is exempted in the case of SC / ST/ PWBD candidates; Application fee is to be deposited in the “Hindustan Aeronautics Limited – Recruitment Account” bearing number 30969511830 at any of the core banking branches of State Bank of India in the prescribed Challan (Annexure III) and a Journal Number be obtained. HAL will not be responsible in case of a candidate depositing the Application Fee in the wrong account. No other form of payment is accepted; Candidates are required to pay commission charges of Rs. 50/- per Challan for depositing fee at other than SBI, Industrial Finance Branch, Residency Road, Bangalore-560025. How To Apply → Eligible and interested candidates are required to download the Application Format hosted on the HAL Website along with this detailed Web Advertisement. Candidates meeting the above specifications may send their applications strictly in the prescribed Application Format printed on A-4 size paper (neatly typed/ handwritten), along with a self-attested recent Passport Size Photograph to the following address: Chief Manager (HR) Recruitment Section, HR Department Hindustan Aeronautics Limited Corporate Office, 15/1 Cubbon Road Bangalore – 560 001. If the information/ Certificates furnished by the candidate in any part/ stage is found to be false or incomplete or is not found to be in conformity with eligibility criteria mentioned in the advertisement, the candidature/ appointment will be considered as revoked / terminated at any stage of recruitment process or after recruitment or joining, without any reference given to the candidate. Application form should accompany original counterfoil of Challan (HAL Copy) for having paid the Application fee (exempted for SC/ST & PWBD candidates). The candidate should retain original counterfoil of the Challan (Candidate’s copy) for future reference. The last date for receipt of applications is 2nd May 2019. Applications received after the due date will not be considered .No application will be received in person on the address mentioned above.. The Applications have to be sent only through Ordinary Post / Speed Post / Registered Post / Courier. Applications received through other modes viz. Fax/ E-mail etc. will not be accepted and will be summarily rejected. Candidates are requested to compulsorily super scribe the envelope with the Name of the post they are applying to (i.e. “Application for the Post of …………………….”). For More Info →The Official Website Of Hindustan Aeronautics Limited. Now Apply For This Job Notification Of HAL Recruitment 2019. Click Here To Download The Official Advertisement.